How exactly do I find out more? So I knew a bit about Ocean Island. But if I really wanted to understand what my father had experienced, I would have to read something of that time. Luckily he’d mentioned reading the “Mid-Pacific Outposts” which had been written in 1945 by Albert Ellis himself (see my earlier post entitled ‘ Where is Ocean Island?’ for more on him). Surely my father had kept a copy – I searched through all of his old boxes – nothing but old school trigonometry books – why on earth had he kept these? I searched the internet and found it listed but not in stock. I searched bookshops for old and rare books – nothing. 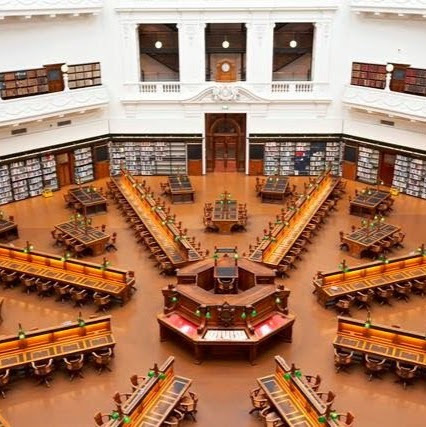 Then I discovered Trove which is the brainchild of the National Library of Australia. What a site! I found articles, newspapers, books, letters, archived for viewing in many cases on-line, dating back to the 1800’s – and mostly for free. It listed the book available in my own State library. The only catch was I would have to go there – it wasn’t available to borrow. I admit that I’d never been to this amazing place in the centre of Melbourne. Once there, I ordered the book and waited for half an hour while they brought it down from some secret spot in the bowels of the library. I explored – there were terminals, a newspaper room, communal desks, people everywhere and books, books and books. It was a busy place. I must have looked like a country hick – mouth open in awe. In truth, I live only a short distance away in suburbia. Soon my book, labled with my name, was ready. It looked and smelt like it’d been in a dark dusty dungeon. I found a place at a communal table and opened the cover.The last time it had been taken out of its dingy hiding spot was in the fifties – a popular book, it wasn’t. After ten minutes of reading, I was only up to page 15 – this was going to be slow. My Ipad was in my bag – so I took photos of the pages I wanted. I glanced around but no-one bothered me or seemed the least bit concerned. There was great information but if Mr Ellis were relying on reviews of his book today, I’m sure the feedback would not be good. The internet has been an amazing source of information and it continually astounds me. But there was stuff in this book that I would never have found on the internet and there are still holes in our information highway waiting to be filled. This entry was posted in Writing and tagged family history, internet, libraries on June 8, 2015 by S.C. Karakaltsas. Thanks so much for checking out my story and also for the book recommendations – I’ve taken a look at these.Your grandfather would have definately known the murdered couple as they were there at the same time too. My book is a work of fiction based on true events so I don’t know if it will join the illustrious ranks of Ellis,Maude and Grimble. It’s great to connect with you.